After a series of Galaxy J3 devices got WFA certified last week, it has now been learnt that the 2018 J7 model SM-J737V is officially Galaxy J7 Aero and SM-J337V is to be called as Galaxy J3 Eclipse 2. The model number SM-J337V which is headed to the Verizon carrier, is to be named as Samsung Galaxy J3 Eclipse 2. The AT&T variant SM-J337A had already made an appearance on Geekbench back in February and the was found to feature a 4-core Exynos 7570 Soc, 2GB RAM and 1.4 GHz clock speed running Android Oreo 8.0 out of the box. SM-J737V and SM-J337V headed to Verizon as the Samsung Galaxy J7 Aero and Samsung Galaxy J3 Eclipse 2, respectively. Samsung recently trademarked two new Galaxy J7 devices namely Galaxy J7 Aero and Galaxy J7 Eon. Though it was pretty clear that they were names of the upcoming 2018 J series smartphones, it wasn’t clear which carriers they were heading to. According to Evleaks, the model SM-J737V is official named as J7 Aero and is headed to Verizon. 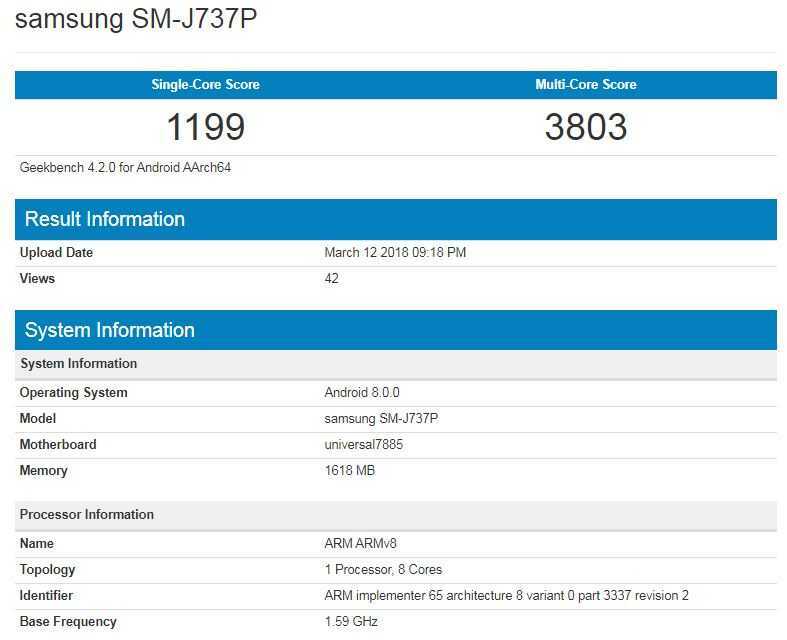 This particular model hasn’t made an appearance in Geekbench or WFA but its counterpart with model number SM-J737P, which is believed to be the Galaxy J7 2018 model has already revealed that it will be powered by Octa core Exynos 7885 Soc coupled with 2GB RAM and 1.59 GHz clock speed, again running Android Oreo 8.0 out of the box. Recently, the Galaxy J3 variants for different carriers appeared in WFA listings with the following model numbers. While trademarking the term “J7 Aero”, Samsung had also trademarked “J7 Eon”. We may have to wait for some more time to find out which carrier names its J7 2018 model as J7 Eon.